The STAR Collaboration has recently published “Coherent diffractive photoproduction of ρ0 mesons on gold nuclei at 200 GeV/nucleon-pair at the Relativistic Heavy Ion Collider,” in Physical Review C 96, 054904 (2017). This paper reports on a special type of heavy-ion interaction, where the ions do not physically collide, but interact via a long-range electromagnetic interaction, whereby photons emitted by one nucleus probe the structure of the other nucleus. The photons come from the electric and magnetic fields carried by the highly charged nuclei. The electric fields radiate radially outward, while magnetic fields circle the ion’s trajectory. The two fields are perpendicular, just like those of a photon, and they can be treated as such. In the reaction considered here, the photon may be thought of as briefly fluctuating to a quark-antiquark pair, as allowed by the Heisenberg uncertainty principle. Quark-antiquark pairs are mesons; this photon fluctuation acts like a meson with the same quantum numbers (spin one and negative parity) as the photon. These virtual (short-lived) mesons can scatter from the target nucleus, and emerge as real mesons. Left: The cross-section as a function of t, the squared momentum transfer to the nucleus. The dips and peaks are a diffraction pattern, akin to the pattern made by a 2-slit interferometer. ‘XnXn’ and ‘1n1n’ are two different STAR data samples.The inset shows the distribution for very small momentum transfers. Right: The two-dimensional Fourier transform of the left panel, showing the density of the interaction sites in the nucleus, as a function of transverse distance from its center. This is a map of where the mesons interacted in the target. Although there is considerable systematic uncertainty (the blue region) near the center of the target, the edges of the nuclei are well defined. 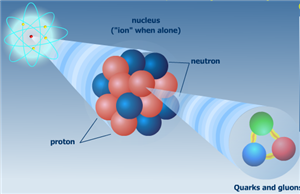 The photons scatter equally from protons and neutrons. But, we can’t tell which proton or neutron an individual meson scattered from. In quantum mechanics, we add the amplitudes to scatter from each target meson. The amplitude is a complex number with a phase which depends on the meson momentum and the position of the target nucleon. By studying how the scattering probability varies with the momentum transfer to the nucleus, we can image the matter distribution in the target. The left panel shows the scattering probability as a function of the square of the momentum transfer (‘t’) for two different STAR data samples. The dips are due to diffraction, like the fringes seen in the classic two-slit diffraction pattern, but with a circular target. The right panel show the two-dimensional Fourier-Bessel (Henckel) transform of the left panel, mapping the interaction density within the target. The transform converts a function of momentum to a function of position. The FWHM of the distribution is 12.34 ± 0.24 fm. Because of nuclear shadowing, this is not just the nuclear density distribution; shadowing will alter the distribution from that of the density of a gold nucleus; these corrections may also alter the apparent size of the nucleus. Unlike electron scattering measurements, this analysis is sensitive to both protons and neutrons. The STAR Collaboration has recently published a paper, Phys. Rev. C 96, 024905, presenting a novel approach to measurements of jet quenching, one of the most important ways to study the Quark-Gluon Plasma (QGP) generated in nuclear collisions at RHIC and the LHC. High energy collisions generate "jets", which are correlated sprays of particles arising from the decay of energetic quarks and gluons. In heavy ion physics, jets provide self-generated tomographic probes of the QGP; they are produced in the collisions itself and interact with the surrounding matter before flying off to be observed in the detectors. This interaction between a jet and the QGP modifies jet properties dramatically relative to those in vacuum (“jet quenching”), and has produced some of the most striking measurements of the QGP. Such jet measurements are challenging, however. Jet quenching was initially discovered by STAR and PHENIX, in Au+Au collisions at RHIC, by studying distributions of single high-momentum particles and their correlations, which are indirect jet messengers. Left Figure: Measured jet rate (signal plus background) in head-on Au+Au collisions (red points) and the "mixed event" background (grey distribution). Right Figure: Azimuthal deflection of jets recoiling from a trigger particle (data points), and a calculation including QCD effects but not scattering in the QGP (red curve). The new STAR paper utilizes the distribution of charged-particle jets recoiling from a high momentum single-hadron trigger to study jet quenching. The huge backgrounds underlying the reconstructed jet signal in Au+Au collisions are measured using a sophisticated event-mixing technique. The contribution of uncorrelated background is then corrected "statistically", i.e. on the measured jet spectrum averaged over the entire ensemble of events, rather than attempting to correct for background on an event-by-event basis. This statistical-correction method enables jet measurements at RHIC over the complete range of jet momenta - including very low momentum - in all collision systems, for large jet-cone radius. This approach enables qualitatively new ways of studying jet quenching. STAR has recently reported the first observation of global polarization of Lambda hyperons in heavy ion collisions. The discovery has been published in Nature 548, 62 (2017) as a cover story. Due to the parity-violating nature of their weak decay, Lambdas reveal the direction of their spin by preferentially emitting the daughter proton along that direction. The average spin direction of a population of Lambdas is the polarization. Lambdas at midrapidity were topologically reconstructed in the STAR TPC, and the Beam-Beam Counters (BBC) at forward and backward rapidity were used to estimate the direction of the total angular momentum of the collision. We discovered that the polarization direction of the Lambdas was correlated at the level of several percent with the direction of the system angular momentum in non-central collisions at √sNN=7.7-32 GeV. It has been well-established that the hot system created at midrapidity in the system may be considered a fluid, and hydrodynamic calculations relate the polarization of emitted particles is directly related to the vorticity - the curl of the flow field - of the fluid. Using this relation, we estimate that the curl of the fluid created at RHIC is about 9×1021 s-1, 14 orders of magnitude higher than any fluid ever observed. Previous results have established the system at RHIC to be the hottest and the least viscous (relative to entropy density) fluid ever created. Our new result adds another record - collisions at RHIC produce the most vortical fluid. This first view of the rotational substructure of the fluid at RHIC represents an entirely new direction in hot QCD research. It has generated considerable theoretical activity in the field, and may have important connections with the Chiral Magnetic and Chiral Vortical Effects (CME and CVE). With increased statistics, there may even be the opportunity to probe the magnetic field produced in heavy ion collisions by measuring the difference in polarization of Lambda and AntiLambda hyperons. Such studies are planned for the future. STAR has recently published its first paper to Phys. Rev. Letters on measurements enabled by the Heavy Flavor Tracker (HFT) high-resolution silicon detector system. The results are the first from a detector based on Monolithic Active Pixel Sensor (MAPS) technology in a collider environment and are the first measurements of D0 elliptic flow, v2, in Au+Au collisions at √sNN = 200 GeV. Heavy flavor quarks, due to their large masses, are considered to offer unique information about QGP dynamics in heavy-ion collisions. A measurement of heavy flavor hadron v2, particularly in the low-to-intermediate pT region, will provide us a better understanding of medium thermalization, and can help quantitatively measure the heavy quark diffusion coefficient – one of the intrinsic transport parameters of the QGP. Figure 1. Left: The Heavy Flavor Tracker (HFT) system which consists of one layer of Silicon Strip Detector (SSD), one layer of Intermediate Silicon Tracker (IST), and two layers of PiXeL detector (PXL). Right: Pointing resolution in the transverse plane as a function of particle momentum (or transverse momentum) at mid-rapidity from experiments at RHIC and the LHC. The HFT consists of three subsystems: one layer of Silicon Strip Detector (SSD), one layer of Intermediate Silicon Tracker (IST) and two layers of silicon PiXeL (PXL) detectors. The HFT-PXL detector is the first application of the MAPS technology in a collider experiment. Its unique features include fine pixel size and thin material budget which provides superior track pointing resolution for charged particles over a broad momentum range. The HFT was designed for precision measurements of charmed hadron production via topological reconstruction of displaced vertices in heavy-ion collisions. The HFT was installed and taken physics data during RHIC Runs 2014-2016. The dataset used in the PRL was about 1.1B minimum-bias-triggered Au+Au 200 GeV events taken in 2014. Fig. 1 (right) shows the track pointing resolution in the transverse plane as a function of particle momentum (or transverse momentum) at mid-rapidity from experiments at RHIC and the LHC. Figure 2. Left: v2 normalized by the number-of-constituent-quarks (nq) as a function of transverse kinetic energy (also normalized by nq) for D0 mesons and light hadrons in 10-40% central Au+Au collisions at 200 GeV. Right: v2 as a function of pT for D0 in 0-80% Au+Au collisions at 200 GeV compared to various model calculations. Fig. 2 (left) shows the v2 normalized by the number-of-constituent-quark (nq) vs. the transverse kinetic energy (also normalized by nq) for D0 mesons from this measurement and other light hadron results. With unprecedented precision, the result shows that D0 v2 follows the same trend as light hadrons with this scaling. In the low pT region, this indicates a clear mass ordering for light hadrons and D0 mesons. In the intermediate pT region, the magnitude of the D-meson v2 is the same as light mesons. This result suggests that charm quarks have gained a similar amount of collectivity in these collisions as light mesons. Fig. 2 (right) shows the D-meson v2 compared to various theoretical model calculations. One interesting observation is that the measured D-meson v2 can be well-described by a 3D viscous hydrodynamic model calculation, which indicates that charm quarks may have reached local thermal equilibrium. The precision of the current data allows us to distinguish different models but there are non-trivial differences between different models that need to be settled. One important physics goal, for the future, is to constrain the temperature dependence of the heavy quark diffusion coefficient parameter via joint investigations between theorists and experimentalists. The D0 v2 results, together with other heavy flavor results from STAR (e.g. the enhancement observed in the Ds and ΛC production in mid-central Au+Au collisions as well as the charm/bottom-separated single-electron RAA measurements) have been reported and highlighted in the recent Quark Matter 2017 conference in Chicago in February [see Guannan's contribution to STAR Newsletter February 2017 edition]. These measurements strongly suggest that charm quarks may have reached thermalization in the Au+Au collisions at RHIC energy. The paper was made possible with significant contributions from colleagues at BNL, CCNU, KSU, LBNL, MIT, Purdue, SINAP, UIC, USTC, and UT Austin, with critical support from the STAR operation and computing teams as well as the paper's GPC. In summary, the first observation of a beam-energy dependent difference in v2(pT) between particles and corresponding anti-particles for minimum bias √sNN = 7.7-62.4 GeV Au+Au collisions at mid-rapidity is reported. The difference increases with decreasing beam energy. It is apparent that, at the lower energies, particles and anti-particles are no longer consistent with the single NCQ scaling that was observed for √sNN = 200 GeV. However, for the group of particles the NCQ scaling holds within ±10% while for the group of anti-particles the difference between baryon and meson v2 continues to decrease to lower energies. We report identified particle pT spectra at mid-rapidity up to 15 GeV/c from p+p and Au+Au collisions at √sNN = 200 GeV. The NLO pQCD models describe the π± spectra but fail to reproduce the K and p(pbar) spectra at high pT. The measured anti-particle to particle ratios are observed to decrease with increasing pT. This reflects differences in scattering contributions to the production of particles and anti-particles at RHIC. At pT ≥ 8 GeV/c, a common suppression pattern is observed for different particle species. Incorporating our p+p data in generating the flavor separated fragmentation functions in the same kinematic range will provide new inputs and insights into the mechanisms of jet quenching in heavy ion collisions. These results have been published at Phys. Rev. Lett. 108, 072302 (2012). Left: Yield ratios π-/π+, pbar/p, K-/K+, p/π+, pbar/π-, and K±, K0S/π± versus pT in p+p collisions, and nominal NLO calculations with AKK and DSS fragmentation functions without theoretical uncertainties. The open squares in panels (d) and (e) are the p/π+ and pbar/π- ratios in central Au+Au collisions with updated uncertainties at high pT, and all other data points are from p+p collisions. Bars and boxes (bands) represent statistical and systematic uncertainties, respectively. Right: (a) RAA of K±+p(pbar), K0S, ρ0, and π± in central Au+Au collisions as a function of pT. The curves are the calculations for K0S RAAwith and without jet conversion in medium. Bars and boxes (bands) represent statistical and systematic uncertainties, respectively. The height of the band at unity represents the normalization uncertainty. (b) The ratios of RAA[K±+p(pbar), ρ0] to RAA(π±) and RAA(K-+pbar) to RAA(K++p). The boxes and shaded bands represent the systematic uncertainties for RAA(ρ0)/RAA(π±) and RAA[K±+p(pbar)]/RAA(π±), respectively. The systematic uncertainties for RAA(K-+pbar)/RAA(K++p) are 2%-12% and left off for clarity. High-energy nuclear collisions create an energy density similar to that of the universe microseconds after the Big Bang. In both cases, matter and antimatter are formed with comparable abundance. Thus, a high energy accelerator of heavy nuclei is an efficient means of producing and studying antimatter. The antimatter helium-4 nucleus (4He),which known as the anti-α (α), has not been observed before. Although the α particle was identified a century ago by Rutherford and is present in cosmic radiation at the 10% level. 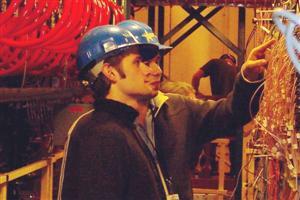 The STAR Collaboration reports the observation of the antimatter helium-4 nucleus, the heaviest observed antinucleus. In total 18 4He counts were detected in 109 recorded Au+Au collisions at center-of-mass energies of 200 GeV and 62 GeV per nucleon-nucleon pair. The yield is consistent with expectations from thermodynamic and coalescent nucleosynthesis models, providing an indication of the production rate of even heavier antimatter nuclei and a benchmark for possible future observations of 4He in cosmic radiation. Left: The top two panels show the <dE/dx> in units of multiples of σdE/dx, nσdE/dx , of negatively charged particles (first panel) and positively charged particles (second panel) as a function of mass measured by the TOF system. The masses of 3He (3He) and 4He (4He) are indicated by the vertical lines at 2.81 GeV/c2 and 3.73 GeV/c2, respectively. The horizontal line marks the position of zero deviation from the expected value of <dE/dx> (nσdE/dx = 0) for 4He (4He). The rectangular boxes highlight areas for 4He (4He) selections : −2 < nσdE/dx < 3 and 3.35 GeV/c2 < mass < 4.04 GeV/c2 (corresponding to a ±3σ window in mass). The bottom panel shows a projection of entries in the upper two panels onto the mass axis for particles in the window of −2 < σdE/dx < 3. The combined measurements of energy loss and the time of flight allow a clean identification to be made in a sample of 0.5 × 1012 tracks from 109 Au+Au collisions. Right: Differential invariant yields as a function of baryon number B, evaluated at pT /|B| = 0.875 GeV/c, in central 200 GeV Au+Au collisions. Yields for (anti)tritons (3H and 3H) lie close to the positions for 3He and 3He, but are not included here because of poorer identification of (anti)tritons. The lines represent fits with the exponential formula ∝ e−r|B| for positive and negative particles separately, where r is the production reduction factor. Analysis details of yields other than 4He (4He) have been presented elsewhere. Errors are statistical only. Systematic errors are smaller than the symbol size, and are not plotted. High energy polarized p + p collisions at √s = 200-500 GeV at RHIC provide a unique way to probe the proton spin structure and dynamics using hard scattering processes. The data taking period in 2009 of polarized p + p collisions at √s = 500 GeV opens a new era in the study of the spin-flavor structure of the proton based on the production of W±. W± bosons are produced predominantly through u + d (u + d) collisions and can be detected through their leptonic decay. The production of W bosons in polarized proton collisions allows for the observation of purely weak interactions, giving rise to large, parity-violating, longitudinal single-spin asymmetries. We report the first measurement of the parity violating single-spin asymmetries for midrapidity decay positrons and electrons from W+ and W- boson production in longitudinally polarized proton-proton collisions at √s = 500 GeV by the STAR experiment at RHIC. The measured asymmetries, AW+L = -0.27 ± 0.10 (stat.) ± 0.02 (syst.) ± 0.03 (norm.) and AW-L = 0.14 ± 0.19 (stat.) ± 0.02 (syst.) ± 0.01 (norm. ), are consistent with theory predictions, which are large and of opposite sign. These predictions are based on polarized quark and antiquark distribution functions constrained by polarized DIS measurements. At midrapidity, W± production probes a combination of the polarization of the u and d (d and u) quarks, and AW+(-)L is expected to be negative (positive). The measured AW+L is indeed negative at the 2.7 sigma level, which is a direct consequence of the positive u quark polarization. The central value of AW-L is positive as expected with a larger statistical uncertainty at the 0.7 sigma level. Our AL results are consistent with predictions using polarized quark and antiquark PDFs constrained by inclusive and semi-inclusive pDIS measurements, as expected from the universality of polarized PDFs. Future high-statistics measurements at midrapidity together with measurements at forward and backward pseudorapidities will focus on constraining the polarization of d and u quarks. The Run 11 data set will allow to expand the first W measurement at midrapidity to higher precision. The installation of the Forward GEM Tracker in summer 2011 provides the needed extension of the tracking capability in front of the STAR Endcap Electromagnetic Calorimeter. A recent paper from the STAR Collaboration published in Physical Review Letters proposes using the higher moments of net-proton multiplicity distributions produced in high energy heavy-ion collisions as an observable for locating the QCD Critical Point. It has been shown that a careful choice of the products of the moments of the net-proton distributions form observables that can be related to the ratios of various order baryon number susceptibilities computed in QCD (basic theory of strong interactions) calculations. Thus the measurements provide a way for comparisons of heavy-ion collision data to first principle QCD calculations on lattice. Since susceptibilities diverge at critical point, these products of moments of net-proton distributions are also expected to take up larger values at the critical point. Thus the measurements reported provide a unique and new observable to search for landmark QCD critical point in QCD phase diagram of Temperature vs. Baryon chemical potential,in high energy heavy-ion collisions. The measurements (product of kurtosis times the variance of net-proton distribution is shown in the figure) carried out at three different beam energies have been used to rule out the presence of QCD critical point below 200 MeV baryon chemical potential in the QCD phase plane. In high energy heavy-ion collisions the moments of net-protons, related to baryon number susceptibilities, have been shown to be independent of the system volume. QCD calculations on lattice have shown such a case happens when the system undergoes a cross over transition between hadronic and quark-gluon phases. In the near future these measurements (as indicated by the arrows at the bottom of the figure) will be carried out at varying collision energies or baryon chemical potential at the Relativistic Heavy Ion Collider to locate the QCD critical point. This is one of the physics goals of the RHIC Beam Energy Scan Program, moving towards that direction the STAR experiment has collected a good data set at beam energies of 7.7, 11.5 and 39 GeV this year. Nuclear collisions recreate conditions in the universe microseconds after the Big Bang. Only a very small fraction of the emitted fragments are light nuclei, but these states are of fundamental interest. We report the observation of antihypertritons—comprised of an antiproton, antineutron, and antilambda hyperon—produced by colliding gold nuclei at high energy. Our analysis yields 70 ± 17 antihypertritons ( ) and 157 ± 30 hypertritons ( ). The measured yields of ( ) and 3He (3 ) are similar, suggesting an equilibrium in coordinate and momentum space populations of up, down, and strange quarks and antiquarks, unlike the pattern observed at lower collision energies. The production and properties of antinuclei, and nuclei containing strange quarks, have implications spanning nuclear/particle physics, astrophysics, and cosmology. Highlights from the STAR papers: Long range rapidity correlations and jet production in high energy nuclear collisions and Growth of Long Range Forward-Backward Multiplicity Correlations with Centrality in Au+Au Collisions at sqrt(sNN) = 200 GeV . Submitted for publication to Physical Review C and Physical Review Letters respectively. The STAR experiment has now reported two interesting results on long range correlations in rapidity. One of the experimental observation is from a correlation study in azimthal angle and pseudorapidity for produced charged hadrons with respect to a particle with larger transverse momentum. Such studies revealed a jet-like correlation at small pair phase space separation (in azimuth and pseudorapidity - near side) which seems to be unmodified in central Au+Au collisions relative to d+Au and a significant correlated yield in central Au+Au collisions at large pair separation in pseudorapidity (the RIDGE). The ridge is observed in Au+Au collisions and not observed in d+Au collisions (See figures). Highlights from the STAR paper: Center of mass energy and system-size dependence of photon production at forward rapidity at RHIC. Submitted for publication to Physics Letters B. Several interesting features of the dependence of particle density in pseudorapidity have been observed in Au+Au collisions from the experiments at the Relativistic Heavy-Ion Collider (RHIC). Particle production is found to follow a unique, collision energy independent, longitudinal scaling in p+p and d+Au, as well as in heavy-ion collisions. Such longitudinal scaling is also found to be independent of collision centrality for photons. The total charged particle multiplicity (integrated over the full pseudorapidity range) per average number of participating nucleon (< Npart >) pair is found to be independent of collision centrality by PHOBOS experiment. However, at mid-rapidity (|eta| <1), the PHENIX experiment showed that charged particle multiplicity per < Npart > is observed to increase from peripheral to central collisions. The charged particle production scales with a combination of < Npart > and average number of binary collisions < Nbin >. These clearly indicates that the mechanism of particle production could be different in different pseudorapidity regions. It is believed that the scaling of particle multiplicity with < Npart > indicates the dominance of soft processes in particle production, whereas scaling with average number of binary collisions (< Nbin >) indicates the onset of hard processes (pQCD jets). Highlights from the STAR paper: J/psi production at high transverse momentum in p+p and Cu+Cu collisions at sqrt(sNN) = 200 GeV Submitted for publication to Physical Review Letters. (a) If nuclear modification factor is less than one it could be due partonic energy loss in dense matter, here the J/Psi formation then likely proceeds through a channel carrying color. 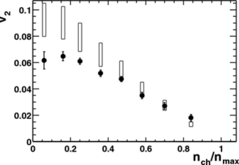 Highlights from the STAR paper: K/pi Fluctuations at Relativistic Energies . Submitted for publication to Physical Review Letters. Strangeness enhancement has been predicted to be one of the important signatures of the formation of the quark gluon plasma (QGP). The study of dynamic fluctuations in event-by-event K/pi ratio may produce information concerning QCD phase transitions and may lead to the observation of the critical point in the QCD phase diagram. Studying fluctuations of particle ratios has few advantages, it has been argued that considering fluctuations of the multiplicity ratio eliminates the effect of volume fluctuations, further fluctuation of the particle ratio like K/pi could be sensitive to the particle numbers at chemical freeze-out and not at kinetic freeze-out. STAR experiment has recently reported the results on beam energy dependence of event-by-event K/pi ratio fluctuations at RHIC. Highlights from the STAR paper: Measurement of D* Mesons in Jets from p+p Collisions at sqrt(s) = 200 GeV. Submitted for publication to Physical Review D Rapid Communications. Studies by the ALEPH, L3 and OPAL Collaborations of the D* +/- meson content in jets show that the production from Z0 decays in e++e- collisions is dominated by D* mesons that carry large fractions of the jet momenta, consistent with the jets being produced from primary c (anti-)quarks. In pbar + p collisions at 630 GeV and 1.8 TeV, the UA1 and CDF Collaborations have observed D* +/- mesons in jets with transverse energies larger than 40 GeV. Their fractional momenta are found smaller, consistent with a different production mechanism in which the D* mesons originate from gluon splitting into c cbar pairs. At top RHIC energy, heavy quarks can still be produced via gluon splitting. Perturbative QCD suggests that these contributions are small, and that the majority of the heavy quarks originate from gluon-gluon fusion. These expectations, however, have not until now been confronted with data at RHIC. The STAR experiment presents the first measurement of charged D* mesons in inclusive jets produced in p + p collisions at a center of mass energy of 200 GeV at RHIC which addresses the above issue. The charged D* andidates were identified through the decay sequence D*+ --> D0 pi+, D0 --> K-pi+ and its charge conjugate. The D*+ and D*- yields of 184 +/- 44 and 169 +/- 45 were obtained in inclusive jets with 11.5 GeV mean transverse energy. Highlights from the STAR paper: Observation of Two-source Interference in the Photoproduction Reaction Au Au -> Au Au rho0. Submitted for publication to Physical Review Letters. In ultra-peripheral relativistic heavy-ion collisions, a photon from the electromagnetic field of one nucleus can fluctuate to a quark-antiquark pair and scatter from the other nucleus, emerging as a Rho0. The Rho0 production occurs in two well-separated (median impact parameters of 20 and 40 fermi for the cases considered here) nuclei, so the system forms a 2-source interferometer. At low transverse momenta, the two amplitudes interfere destructively, suppressing Rho0 production. The produced Rho0s decay almost immediately at two well-separated points, so any interference must develop after the decay, and involve the pi(+) pi(-) final state. Since the pions go in different directions, this requires an entangled pi(+)pi(-) wave function which cannot be factorized into separate pi(+) and pi(-) wave functions; this is an example of the Einstein-Podolsky-Rosen paradox (for more details on this paradox look at reference below). The figure shows the the uncorrected midrapidity minimum bias Au+Au 200 GeV dN/dt spectra as a function of t(perp) = (pT*pT). These data are compared simulations based with and without interference. The measured dN/dt spectrum is roughly exponential, but with a significant downturn for t(perp) < 0.0015 GeV*GeV, consistent with the predicted interference (dashed histogram). The no-interference histogram is almost exponential (solid histogram), dN/dt ~ exp (-kt(perp)), where k is related to the nuclear radius. Highlights from the STAR paper: Energy and system size dependence of phi-meson production in Cu+Cu and Au+Au collisions. Submitted for publication to Physics Letters B. In a Quark-Gluon Plasma, thermal s and sbar quarks can be produced by gluon-gluon interactions. These interactions could occur very rapidly and the s-quark abundance would equilibriate. During hadronisation, the s and sbar quarks from the plasma coalesce to form phi-mesons. Production by this process is not suppressed as per the OZI (Okubo-Zweig-Izuka) rule. This, coupled with large abundances of strange quarks in the plasma, may lead to a dramatic increase in the production of phi-mesons and other strange hadrons relative to non-QGP p+p collisions. Alternative ideas of canonical suppression of strangeness in small systems as a source of strangeness enhancement in high energy heavy-ion collisions have been proposed for other strange hadrons (e.g Kaon, Lambda, Cascade, Omega). The strangeness conservation laws require the production of an sbar-quark for each s-quark in the strong interaction. The main argument in such canonical models is that the energy and space time extensions in smaller systems may not be sufficiently large. This leads to a suppression of strange hadron production in small collision systems. These statistical models fit the data reasonably well. According to these models, strangeness enhancement in nucleus-nucleus collisions, relative to p+p collisions, should increase with the strange quark content of the hadrons. This enhancement is predicted to decrease with increasing beam energy. Highlights from recent data taken by STAR with the lowest beam energy collisions at RHIC - Au+Au collisions at 9.2 GeV. These were presented for the first time at the International Conference on Strangeness in Quark Matter, 2008, Beijing China. One of the main aim of high energy heavy-ion collisions is to map the QCD phase diagram. The goal being to locate the QCD phase boundary (separating matter with hadronic degrees of freedom from matter with quark gluon degrees of freedom) and the QCD critical point (where the first order phase transition ends). The phase diagram is plotted as temperature versus baryon chemical potential. These quantities can be changed by varying the colliding beam energy to map the phase diagram. The temperature and baryon chemical potential can be measured from the produced particle spectra and ratios. Then one looks for signatures for different phases and for the QCD critical point. In addition STAR also would like to study the beam energy which corresponds to onset of several interesting observations seen at top RHIC energy (Au+Au 200 GeV) : Number of constituent quark scaling of elliptic flow parameter for produced hadrons, enhanced correlated yields at large delta_eta for delta_phi ~ 0 (Ridge) and the suppression of high transverse momentum hadron production in heavy ion collisions. In order to achieve the above goals STAR has proposed a beam energy scan program at RHIC spanning beam energies from 5 GeV to 50 GeV. As a first step towards achieving this goal, recently STAR collected data from a test run for Au+Au collisions at 9.2 GeV. The events for this test run was collected at a rate of 0.7 Hz. The first results were presented at the SQM2008. Here we discuss only a small subset of the results. Highlights from the STAR paper Hadronic resonance production in d+Au collisions at 200 GeV at RHIC accepted for publication in Physical Review C.
The particle identification capability of the Time Projection Chamber in STAR and its large acceptance enables us to measure many hadronic resonances produced in the high energy collisions. Resonances are strongly decaying particles with lifetimes x velocity of light that are of the order of the size of the hot and dense medium produced in heavy-ion collisions. The in-medium effects related to the high density and/or high temperature of the medium can modify the properties of short-lived resonances, such as their masses, widths, and even their spectral shapes. STAR experiment has recently reported the measurement of the following resonances for colliding beam energy of 200 GeV. These are reconstructed from their hadronic decay channels using invariant mass technique in d+Au collisions - rho(770), K*(892), Delta(1232)++, Sigma(1385), Lambda(1520). One interesting feature was observed in the transverse mass distribution of these resonances measured at midrapidity. As shown in the figure, they seem to follow a generalized scaling in d+Au collisions between transverse mass range of 1 - 2 GeV/c2. Such a scaling could be envisaged within the idea of saturation of gluon density in the nucleus for high energy collisions. However such scaling has been observed in p+p collisions at ISR, SppbarS, RHIC energies. Also the resonances in d+Au collisions do not show any difference in the shape of the transverse mass distribution between baryons and mesons at higher transverse mass. Differences were earlier observed for non-resonant particles along baryon-meson lines. Highlights from the STAR paper Systematic Measurements of Identified Particle Spectra in p+p, d+Au and Au+Au Collisions from STAR submitted recently to Physical Review C.
STAR experiment has recently reported systematic measurements of identified particle spectra in pp, d+Au and Au+Au collisions. Along with reporting several interesting results for the above collision systems at different energies we have also presented in detail the particle identification procedure in STAR Time Projection Chamber and the various correction factors associated with the extraction of the yield and shape parameters for the transverse momentum spectra of produced hadrons. In this focus article we present two results from this work. 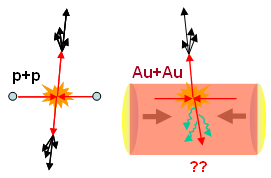 For Au+Au collisions,mean pT, which characterizes the slope of the transverse momentum spectra are found to increase significantly with increasing collision centrality or decreasing impact parameter of the collision. The trends are similar at 62.4 GeV, 130 GeV, and 200 GeV, and mean pT qualitatively agree with each other at the same dNch/dy. This suggests that the kinetic freeze-out properties in Au+Au collisions are rather energy independent for the measured collision energies. Highlights from the STAR paper Forward Neutral Pion Transverse Single Spin Asymmetries in p+p Collisions at sqrt(s)=200 GeV submitted recently to Physical Review Letters. The production of particles with high transverse momentum from polarized proton collisions at high energies is sensitive to the quark and gluon spin structure of the proton. One challenge to theory has been to understand the sizable azimuthal asymmetry of particles produced in collisions of transversely polarized protons, known as analyzing power (AN) or transverse single spin asymmetry (SSA) for inclusive pion production in polarized p + p collisions over a broad range of collision energies and in semi-inclusive deep inelastic scattering (SIDIS) from transversely polarized proton targets. Spin-correlated transverse momentum dependent (TMD)distribution functions (Sivers effect), in conjunction with initial- or final-state color-charge interactions, can explain large AN. These functions describe parton orbital motion within the proton, and so are important to explore to understand the structure of the proton. Highlights from the STAR paper Beam-Energy and System-Size Dependence of Dynamical Net Charge submitted recently to Physical Review C.
Anomalous transverse momentum and net charge event-by-event fluctuations have been proposed as indicators of the formation of a quark gluon plasma (QGP) in high-energy heavy ion collisions. In particular, Koch et al. have estimated that entropy conserving hadronization of a plasma of quarks and gluons should produce a final state characterized by a dramatic reduction of the net charge fluctuations relative to those observed in a hadron gas. Published STAR measurements indicate the fluctuations observed in Au + Au collision at center of mass energy of 130 GeV are little suppressed relative to those observed in p + p collisions . STAR found the measured fluctuations in this collision system and energy are in qualitative accord with expectations based on hadron gas models. It is thus interesting to study the magnitude of the fluctuations as a function of the colliding system size by varying both collision centrality and colliding nuclei. There is also a possibility that final state interactions may partly wash out the expected suppression through collision and diffusion processes . Best conditions to observe the predicted suppression may not be at 130 GeV. It is,therefore, of great interest to carry out a study of the system size, and beam energy dependence of the net charge fluctuations. Highlights from the STAR paper System-size independence of directed flow at the Relativistic Heavy-Ion Collider submitted recently to Physical Review Letters. Directed flow refers to collective sidewards deflection of particles and is characterized by a first-order harmonic (v1) of the Fourier expansion of particle's azimuthal distribution w.r.t. the reaction plane in heavy-ion collisions. STAR has recently submitted to Physical Review Letters multiple differential measurements of v1 for Au+Au and Cu+Cu collisions at center of mass energies of 200 and 62.4 GeV as a function of pseudorapidity (eta), transverse momentum, and collision centrality. We find that directed flow violates the "entropy-driven" multiplicity scaling which dominates all other soft observables. STAR has reported an intriguing new universal scaling of the phenomenon with collision centrality. Neither Boltzmann/cascade nor hydrodynamic models are able to explain the measured trends. Highlights from the STAR paper Charmed hadron production at low transverse momentum in Au+Au collisions at RHIC submitted recently to Physical Review Letters. Charm quarks are likely to be produced only in the early stages and can be a unique tool to probe the partonic matter created in relativistic heavy-ion collisions at RHIC energies. Studies of the number of binary collision (calculated using Glauber model) scaling of the total charm cross section from d+Au to Au+Au collisions can be used to test if charm production is exclusively at the initial impact of colliding heavy ions. The total charm production cross section is also an important input in models of J/Psi production via charm quark coalescence in a Quark Gluon Plasma. Highlights from the STAR paper Indications of Conical Emission of Charged Hadrons at RHIC submitted recently to Physical Review Letters. Experimental observation of jet-quenching studies in STAR revealed: on the away side of a high transverse momentum (pt) trigger particle the correlated yield is strongly suppressed at pt > 2 GeV/c while at lower pt the yield is enhanced and the correlated hadrons appear to be partially equilibrated with the bulk medium and are broadly distributed in azimuth. At this event we celebrate Tim Hallman’s leadership as Spokesperson of the STAR experiment at RHIC for the past six years. We chronicle the experiment’s success, and look forward towards its bright future. In high energy p+p collisions, the hard scattering of quarks and gluons early in the collision leads to the production of jets, narrow streams of particles that allow physicists to detect and understand the scattering. In nuclear collisions at RHIC, jets instead serve as a penetrating probe of the extremely dense nuclear matter formed in the collision. Comparing characteristics of jets in nuclear collisions to jets in p+p collisions has uncovered special properties of dense nuclear matter at RHIC. The 18th International Conference on Nucleus Nucleus Collisions (Quark Matter 2005) was held in Budapest, Hungary, August 4-9. STAR presented new results on several fronts, summarized in two experimental summary talks on the conference's first day and a special focus talk on the last day. STAR contributed 15 parallel talks and many posters. This summer, STAR will hold its semi-annual collaboration meeting in Warsaw, Poland, preceeding the Quark Matter 2005 conference in Hungary. The collaboration meeting will be hosted by Warsaw University of Technology (Politechnika Warszawska), a STAR member institute. Meetings before major conferences give collaboration members the chance to review results, share posters and practice talks. Meetings away from BNL also allow institutions to open their doors to fellow collaborators. As part of a joint venture between BNL and JINR (Dubna) called the Online Science Classroom, a series of RHIC Lessons have been created by STAR Collaborators in Dubna. These lessons introduce many aspects of the research carried out by STAR, from the process of colliding different beams of particles to the challenges of studying the formation of a quark-gluon plasma. The lessons require Macromedia Flash Player. 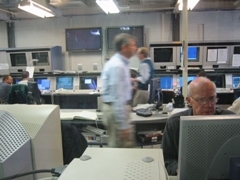 One of the primary missions of STAR is to provide rigorous training for graduate students, who account for much of the hands-on detector and analysis efforts for the experiment. As a result, STAR has produced an impressive number of graduate degrees over a wide range of thesis topics. Click here for a list of graduate thesis titles, with links to many thesis files. Nearly four years have passed since STAR's first publication, on the observation of evidence for strong early expansion in Au+Au collisions at RHIC, appeared in Physical Review Letters. Since then, 23 other Physical Review Letters have followed, more than any nuclear physics experiment in history. A growing list of brief summaries of our publications is available on our website. As the amount of data recorded by the STAR Experiment accumulates, the data storage and data processing needs grow as well. STAR is an active participant in the Particle Physics Data Grid, a project to manage and distribute data and data analysis tasks across a large network of computing facilities around the country. STAR Collaborators comprise a community of scientists and technicians from 13 countries on four continents, and getting everyone together isn't always an easy task. That's one reason behind STAR Regional Meetings, smaller gatherings of STAR members a bit further from RHIC than the BNL physics building. Regional Meetings were held in China and Russia in 2003. 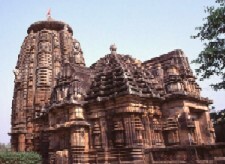 Next up: Bhubaneswar, India, in October.